Take a Dosa pan, add 1 tea spoon oil to it and make a small but thick Dosa Let it cook on one side. 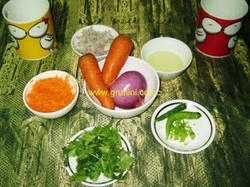 Spread grated carrot, finely chopped onions and green chilies’ on the other side and let it cook. Cook in a medium flame. 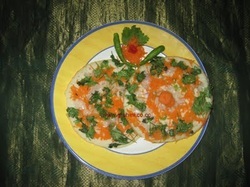 Easy tasty onion, carrot utthappam is ready. Serve hot…..with any chutney or pickle.